Tickets go on sale August 1, and they are expected to go quickly. For information visit tedxmemphis.com and follow @TEDxMemphis on Twitter. Last spring Mr. Luke Jensen and Patton Orr, organizers of TEDxMemphis, gave a chapel presentation detailing their plans a Memphis conference, now set for August 29. On August 29 Memphis will experience its inaugural TEDx conference, featuring 18 speakers who have turned ideas into action. The roster includes Dr. Scott Morris, CEO of the nonprofit Church Health Center in Memphis; Mr. Kimbal Musk, co-founder of The Kitchen restaurants (opening at Shelby Farms and Crosstown Concourse) and Learning Gardens (opening at 100 Memphis schools); and Mr. Cliff Goldmacher ’87, songwriter, producer, and musician. Co-organizer Patton Orr, a senior, who began turning his idea for a conference into action two years ago, says he is excited to see TEDxMemphis coming to life. Orr first learned about TED conferences when his sister, Caroline Orr (Hutchison ’12), worked on the organizing committee for TEDxUNC (University of North Carolina) in 2013. He became fascinated by TED Talks, short (18 minutes or less) recorded presentations by experts and thinkers from around the world that can be seen via ted.com. He began a campaign to drum up interest at MUS and in the community. An acronym for technology, entertainment, design, TED is a nonprofit organization started in 1984, dedicated to spreading ideas, usually in the form of its talks, recorded in more than 100 languages. The organization sponsors major TED conferences and parallel TEDActive conferences (with live simulcasts of the talks) as well as smaller, independently organized TEDx conferences in cities around the world. Orr started a TED club at MUS, where students watch the talks and discuss the subject matter. He also launched a similar club for teens in the community that meets up once a month at Benjamin L. Hooks Public Library. And he set his sights on organizing a conference. 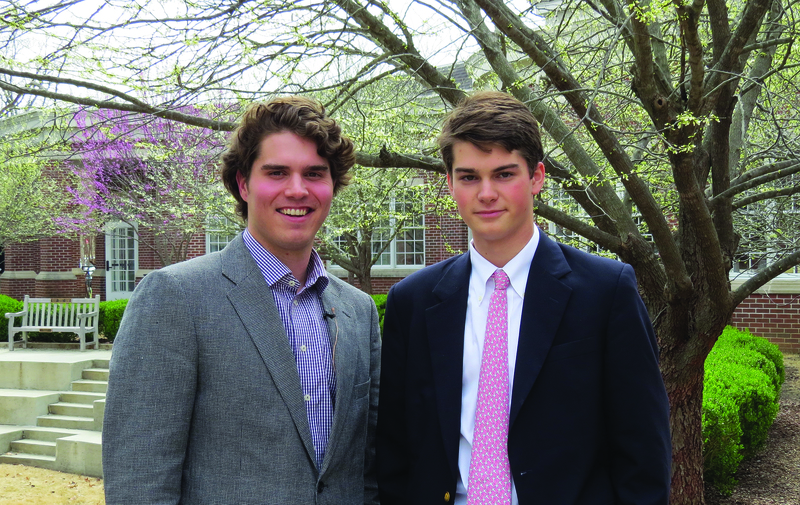 He discussed the idea with Lower School Principal Clay Smythe ’85, who encouraged him to seek a “loaned executive,” who could help with the process. (The term comes from the United Way program of enlisting business executives to help with campaigns.) The name that came to Orr’s mind was Mr. Luke Jensen ’07, whom he knew from church. Jensen, an associate with Cushman & Wakefield/Commercial Advisors agreed to join the campaign. He applauds the efforts of his young partner. Together Orr and Jensen attended a TEDActive conference in Whistler, British Columbia, in March 2014. (MUS sponsored their trip.) Afterward, they gave a talk in Hyde Chapel on their experience. Now, with the help of a team of local organizers, the conference is set for the University of Memphis Michael D. Rose Theatre August 29 from 10 a.m. – 4 p.m.
Orr, who expects close to 1,000 people at the event, says interest has been growing.